After reading all ur doubts, now I'am doubtful. Clarify if it is "not more than two/not more than three" means can our answer be two and three, or else only one and two words? It means you cannot write any MORE words than the numbers given. 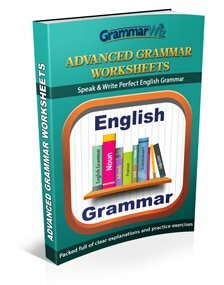 "Not more than two words"
"Not more than three words"
It means that your answer can contain one, two or three words but in no case the fourth word provided the answer is grammatically correct and gives the same information as given by the speaker / writer. hi.. i have written an answer 'super market' is that correct? i am confused whether it is supermarket.. will i get marks for that? The correct word is 'supermarket' so what you put would likely be wrong but the official ielts site doesn't specifically discuss that so it is difficult to say for sure whether they would accept it. Hi! I've written 2 million, whether it is one word or two!! It's confusing. No more than one word. My answer was 15th June. Is it two words or one word? You don't need the 'st' but yes it should be ok. So, do we consider it (NOTICE BOARD) is two words or single word word, as per meaning it is giving. How to write a time range? In my test, answer to one question was 25-30 minutes. I wrote it as "25 to 30 minutes". Instructions were "No more than three words and/or a number". If my answer is incorrect, how can we write the same answer by following the instructions? It's not possible to write that answer as it is two numbers and the instructions you gave say one. Which test are you referring to? Are you sure that is the correct answer? Or could it be an error in the test (assuming it is a practice test)? The instruction was: "NO MORE THAN TWO WORDS" but the answer was "Sir Jozeph Banks", hovewer, following the instruction I've written just "Jozeph Banks". But surprisingly the key was "Sir Jozeph Banks"!!!!! Hoow??? There were required only TWO WORDS! It sounds like an error in the book. Which practice book were you using? Which is the correct spelling licence or license? Licence is a noun, license is a verb. Before learning to drive, you apply for a provisional driving licence, but the DVLA must license you to drive. 1.a number and a word both?? "There are ........... on the course" the answer would be "5 people". "There are ....... people on the course" the answer would be "5". "There are 5 ...... on the course" the answer would be "people". 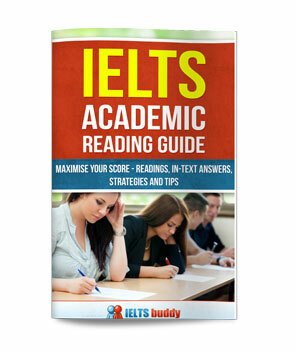 In ielts cambridge 9 listening test 3 section 2 question 20: '5 to 12', is that still counted? I checked and in the answer key it says '5 to 12' so I'm not sure why you are querying it. That is one word and numbers. If they say not more than three words and in my answer, I wrote two words will they give me marks or not? No more than 3 numbers means You have the option of 1, 2, or 3 words. But if the answer is 3 words you have to write all those words. So your answer is wrong. Could you please explain below instruction with examples? All of those are ok. I wrote 14 instead of 14 days for one word/number it will be marked correct? If the missing information needed "14 days" and that was what was in the answer key, then "14" will be wrong. But it would have to be "One word and / or a number". Is TIME-TABLE one word or two words??? Hyphenated words are counted as one word. I don't understand in the ielts instructions which is given by 'No more than three words'. The actual answer is 'town center area'. I wrote 'town'. Will they mark it correct? 'No more than three words' means that the answer could be anything from one to three words, no more than that. So an answer would not consist of four or five words. But it could be one, two or three words. But regardless of that, there is still a 'correct' answer. If the answer in the answer key was 'town center area' then 'town' is wrong. In Cambridge 9 test 1 Listening section, the instruction says no more than 3 words, but the answer key was "clear voice", while I wrote "a clear voice". Is that OK? I just checked and 'a clear voice' should be correct because it fits the answer and it does say you can use three words. Those are based on real tests but I can't know what they would have done when it was actually marked in the past. You should have got the mark though. 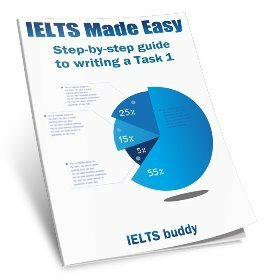 Is "two hundred fifty five" one word or 3 word as per IELTS exam rule? 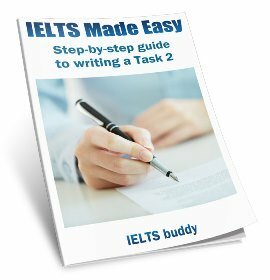 Is "two hundred fifty five" one word or 3 words as per IELTS exam rule? I encounter a Question, the answer is "5 to 12" but the question requires one word and/or numbers, how it can be possible? The answer contains 3 words! Which book was if from? It's possible it's an error. However, that is actually two numbers and one word. You say the instructions said "one word / and or numberS" (plural). If that is what it says then '5 to 12' fits the requirements as it is one word and numbers. "Not more than Two words and / or a number". If the speaker says 'five star hotel', what should I write? 'Five star' or '5 star'. Either would be ok. Numbers can be written as words or the actual number (though of course with telephone numbers, addresses or postcodes which have sequences of numbers you should write the numbers). The instructions says not more than 2 words. And I answer the question in 2 words. Like 'castle road' but the answer shown was 'castle'. Will this be considered as correct answer or wrong ? Not MORE than two words means the answer could be one or two words, so if the answer was 'castle' and not 'castle road' then your answer will be wrong. But it's not possible to know if 'castle road' would fit without seeing the test you are referring to and hearing the audio. Hi! I’ve done my ielts exam, in listening test the instruction was answer not more than 2 words and or a number. The answer is '17 Bright Road'. I answered "Bright road" in the address part because it only asked for 2 words and or a number. Is this correct? No that's wrong if it says in the answer key it was '17 Bright Road'. The instructions were '2 words AND / or a number'. So '17 Bright Road' fits that as it is 2 words and a number. It will probably be marked wrong. You must follow the instructions. Hi, I just want to check in the listening practice paper no more than two words, I wrote "low" in my answer but when I checked the answer sheet answer was "very low". so my answer will right or wrong? If the answer key is telling you you must have 'very low' then 'low' will. be wrong (assuming the answer key is correct). I'd have to see the test though to know if that is correct or not. It depends what was written in it and what was said. I'm having a IELTS listening practice test and there's a question that says "women are three times more likely to miss the ________." When i was listening to the narrator I know that I heard the answer to it correctly which is "likely to miss the OFFICE ATMOSPHERE." But when the test shows the answers, it says that the answer should only be "office" and the atmosphere is just part of the sentence. (I don't know if I'm making any sense). Anyway, how will I know if I should only be writting the word "office" or "office atmosphere" or is it ok to write either. I hope i'm making sense. it's me again. In one of the questions in the listening practice test, I answered "18" (number) but the correct answer was "eighteen" (word). is it ok to answer in numbers or should I answer all in words? Yes you can write 'eighteen' or '18'. "Office atmosphere" sounds correct from what you said. Maybe it is an error in the test you are using? In instructions it said "no more than 3 words" and in answer i wrote "two percent" instead of "2 percent" now my answer marked as wrong in a mocktest and as well as British Council website. Whats wrong with my answer? I don't think there is anything wrong with your answer. If it said "No more than three words" and you wrote "two percent" then that is correct, as using numbers or words is ok.
Maybe it's an error in the answer key. In few of the listening test i find that they ask for " no more than three words" as answers , but if they have mentioned about a number in the answer , say for example number "27" , so should we write in words or in number? its really confusing, please help. Usually the number or words are ok, but to write the number it should also say "NO MORE THAN THREE WORDS AND / OR A NUMBER". If it doesn't say at the end that you can also use a number then you should write "sixteen" to be safe. I did a test and it asked to fill in a pie chart with blanks. The percentage signs were already given so I only filled in the number. The question was no more than three numbers and or a word. So is it wrong just to have a number on my answer sheet or do I need to write down the percentage sign as well? Question says WRITE NOT MORE THAN THREE WORDS? I write 'the student union' and the correct answer says 'Student Union'. The doubt is I have write the correct answer along with the additional word and the total words are three, within the limit. Is it marked incorrect if I write the extra word with correct word? Please reply soon as possible. No more than five words and/or a number. What does it mean? And if my answer is 3 p.m., Is it acceptable? How many words in 3p.m. I've never heard of a question giving you the option of 5 words. 3 is normal the maximum. Anyway, yes '3 pm' is ok. That is just a number (and possibly one word). One word and/or a number??? Did everybody finish Cambridge 9? I am kind of confused about the second test, in section one, questions about India girl's birthday. I could hear clearly, it was March 31st, 1972. But the answer require to be only one word and/or a number??? How could it be possible ? March 31st, 1972------------> there are THREE words!! Comments for One word and/or a number??? I think it must be an error because in the answer key they have put "31 March", which fits "One word and / or a number". But then in the actual transcript they have underlined "13 March 1976". That would be one word and two numbers. If an error was made like that I'm sure they would let you have the mark if you put either of those. Last time I took the Ielts test and I had almost the same question with the same instruction no more than one word or/and number. Question required to put date of birth of a girl, so as I know we can not put date of birth without including either date or year. I was confused, but I put only date and month even though I heard the year too. Am I correct ? How could I know how they marked my answer? my name is Mathew..the answer 'flat 6A' contains how many number and words. my question was no more than 2 words and or a number. could you please help me.. I would say that is one word and one number so you are ok. There was a date of birth of a girl to be written. I heard the exact date like 18 October 1980. But I wrote 18 October because with years it would have been 2 numbers and one word. Which is correct? Can you enlighten me please. If they said 'olive oils' the answer is 'olive oils'. If they said 'olive oil' the answer is 'olive oil'. A date of birth requires day (number), month and year, eg. 18 September 1974. A birthday requires a day and a month only, eg. 18 September. Did the question ask you to give her date of birth or her birthday? I am a little bit confused about the answer. The answer is 5 to 12 and also the instruction said that ONE WORD AND/OR NUMBERS. I cant figure out, could you please explain it? In reading, Question was how many beats a minute a smoker take? What should i do??? This is puzzling. In that situation there was no need to repeat 'beats' as it is in the question. It was just asking for the number. However, your answer wasn't wrong and it fits the number of words so I think you'd probably get the point in the test. In Cambridge 9 test 2, they said write one word and/or a number. Their answer was 31 March, and I wrote 31/03/1972. They didn't mention the year, is my answer 31/03/1972 correct? Because I think it is considered as one number? My second question, in Cambridge 9 test 3, question 10 they said write one word and/or numbers, their answer is 5 to 12 and I wrote 5-12, is my answer correct? thank you. I think some other people have mentioned that question of that test because they are confused. I think it may be an error in that test because if you take a birth date then yes, most people are going to put the full date. The year is mentioned in the reading but it is not in the answer key and the instructions don't let you write two numbers. Always try and follow the instructions but I do think that one is a error. As for the other you mention, yes 5 - 12 should be ok. Again it should be in the answer key. I wasn't sure if my number looked fine. For example the answer was 15,but I wrote both 15/ Fifteen. Will I be marked wrong for this? Now I am totally confused and lost. Please help me out. Which one is correct? A combination of number & symbol counts as one number? Or one number & one word? Another case is 2/3, is it one word or number? It should be fine to write 92.4% or 92.4 percent. Maybe it was an error in the answer key and they did not tell you that it could also be "%" (or "percent" in the case of your other example). Which books are you using to practice from? I'm not sure if 92.4% counts as one number or one number and one word, but that does not matter. The percentage is needed if it is given in the listening (and is not written on the question sheet) so you would be given the right options to write it. "2-3" would count as two numbers. I did not realize that which answer is true ? All words count as 'words', so yes 'and' would. Could anyone please explain me about this meaning??? They said using no more than three words and / or a number. Can I write both of these sentences? I really don't know among both of this sentences which one is correct???? Thank you for your kindly answering my question. And I really want you to explain me the detail meaning about "USE NO MORE THAN TWO WORDS AND/ OR A NUMBER"
Of course what you do actually write in the answer key will depend on the question. If instructions are not more than two words or number and I wrote complete date of birth including year like 01.10.1986 then is my answer correct? It's difficult to really know if what you wrote is correct without seeing the test to know what was read out and what gap needed to be filled in in the booklet. It does look wrong though because it said two numbers and you used three. As I said though difficult to know without seeing everything. Will i lose all the mark or they will take the right word? Hello, I have a problem in Section 3 of Listening Part of Test 4, Cambridge IELTS 9. Here a part of the dialogue between two persons (Kira and Paul) is attached in image form. 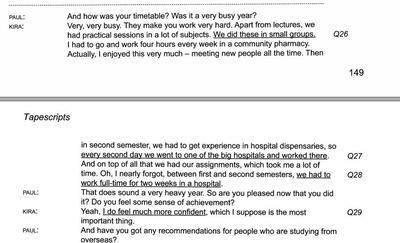 At one point of time during the conversation (the very last underlined sentence), Kira says she feels "much more confident" when asked by Paul how she feels after passing an academic year at her university. Now in question 29 it is asked-"Having completed the year, how does Kira feel?" and in answer key it is written "confident". Since the question has a limitation of NO MORE THAN THREE WORDS AND/OR A NUMBER, would it be right to write MUCH CONFIDENT or MUCH MORE CONFIDENT as answer? I am sure that MUCH MORE CONFIDENT would be accepted even if the answer key says CONFIDENT only, as it does say 3 words is ok. But MUCH CONFIDENT is not grammatically correct (we don't say that in English) so it would be wrong. MORE CONFIDENT may also be accepted. In my IELTS test it was given in question to write only one word. The answer of the one question was 12 July. Want to know does it count as a one word or there is some other way of writing it. That would count as 'one word and a number'. I can't explain why the test you looked at said 'one word'. Maybe it is an error in the test. In one practice test, I answered question type "ONE WORD ONLY" that was "STOCK MARKET". I clearly listened to this word and it is the answer for my question but is this one word or two words?? When I was typed this word in dictionary I got the meaning for "STOCK MARKET" as a whole and there is no hyphenation between stock and market. Please give the clarity about word count in my answer. It's two words. Are you sure your answer was correct? Was there an answer key for the test you were doing? Instructions were no more than three words or a number. I had written 15metres. Is this right or wrong. That's ok though it should be 15 metres, not 15metres. If I write photocard for example, but in the answer key it says photo card, will my answer be wrong? I looked it up and it is not wrong to write photocard. Another example is that in the answer key was education system but I wrote educational system. Will that be wrong? The first one should be marked right. But for the second one it really depends on the type of question it was for. If it had to fit in a gap and 'educational' does not fit grammatically for example it would be wrong. I don't know what you mean by 'in case of a number' but 65% would be ok if it fits correctly in the gap. When there is a word limit ("no more than 2 words"), will the conjunction "and" be counted? Yes all words count so just write in the words that are needed for the answer. Isn't it suppose to mean EITHER WORDS or A NUMBER? EITHER WORDS or A NUMBER? You don't normally get "EITHER WORDS or A NUMBER". "EITHER WORDS and / or A NUMBER"
If we have two words in answer but wrote one word. Will the one word evaluated or corrected?? Your question is not really that clear. If the answer requires two words, for example 'planet earth', then yes you would need those two words. In IELTS practice allowed words was 2. I wrote 'supermarket' but the correct answer was 'local supermarket'. Question is how could I know where I should write 1 or words because 1 word answer is also correct. You say that one word answer was also correct. If that is the case then you will still get the point. When it says no more than 2 words, then the answers could be one word, two words, or possible both - both meaning one word is in brackets which means its optional. Without seeing the actual test you took though I can't really say for sure what was the correct answer. If it's an official IELTS Cambridge test and no mistake has been made with the answer key, then if it say 'supermarket' then I assume 'local supermarket' did not fit for some reason. In my listening test it said no more than one word and the articles were written in the question book but I wrote the articles with the answers in the answer sheet is that okay? No it will probably get marked wrong. You should only place the word that is missing in the gap, not extra words that are on the question sheet. Please tell me if I write one word answer and in the answer key there are two words. My answer will be wrong or correct. Write no more than three words. I'm not really sure if you are asking about whether articles are allowed or if you don't understand what 'no more than three words' means. If it says no more than three words then the answer could be 1, 2, or 3 words, but not more than that. But I don't know whether the correct answer to the question you are asking about was "special grant " or "a special grant". I'd need to see the test. Both fit in terms of the word count but I'd need to know about the context to see if the article should have been there or not. If it did not fit grammatically with the article then it would be wrong. Same for your second question - both of those meet the word count criteria but it depends what the correct answer was. If the answer key said 'grant' then I assume 'special grant' did not fit and is not correct. That means it is correct with or without 'special'. Yes there is a difference, and the key is the word 'and'. In this one you could write three words (or less) AND a number. For example 'pay cheque 5'. But it also says OR a number, so it could be '5' with no words at all. But this one has no AND so you have to choose either some words or a number. 'pay cheque' or '5'. You can't have words and numbers together in the answer. Obviously what you end up actually putting down depends on the question / answer. No more than three words. There was a question which asked that how many dollars for the total trip? It said no more than three words. I wrote twelve hundred dollars but they said the answer is 1200$. It could have been $1200 but not 1200$. If it said 'no more than three words' and you said 'twelve hundred dollars' then that fits and would be correct. Maybe it was an error in the test answers. Was it a real old Cambridge test or from somewhere else? In Cambridge Official Guide, it says "twenty five trees = one word and a number." If this is the case, can "two hundred and fifty-five" to be counted as a number? No more than 3 words my answer is "Sunday second July"
But original is"Sunday 2nd July"
Based on the guide, yes I am guessing that two hundred and fifty-five would be classed as 'a number'. They usually say you can either write numbers as a number or as a word. But to be on the safe side, if they ask for one number like two hundred and fifty-five just write 255. I'm not sure why you would want to write the full words as that will take more time anyway. When we write dates we say '1st' 2nd' etc., or even '1' and '1'. We don't say 'Second July'. That's why it will not be in the answer key. I can't say for sure if they'd give you the point, but I would write things how we normally do it in English otherwise you are in danger of getting it wrong. I would like to ask if it is correct to write an answer "over 45", when the instruction says "NO MORE THAN THREE WORDS OR A NUMBER". I read many forums about IELTS, but did not really get the direct answer. I understand I can write "over 45" in case when it says "NO MORE THAN THREE WORDS OR/AND NUMBER". But it my mentioned situation, I would understand it as "write 3 words, or u can write one number but no words". If it says "NO MORE THAN THREE WORDS OR A NUMBER" then no you can't write words and a number. That statement is giving you a choice - a OR b. You have to choose one. So you can either have one to three words OR write a number, not both. So "over 45" is wrong. I agree with the mentioned explanation and believe the answer "over 45" is wrong. However, it was part of the official IELTS practise exam and it was correct. It is really confusing coz even if a person thinks he/she understands, some should-be-a -wrong answer comes up and in result it is shown as correct one. Which test was it as I can take a look if I have a copy? I found it in the official ROAD TO IELTS - Preparation and practise, where i received an access after signing to the official exam. I attach the link, although I am not sure it will work for someone without the official access and log in data. No I can't access it. I would not worry about it. It may just be an error with that test if you are sure you are answering it correctly. Or you could query it with the owners of the website. It says in question 29 that she is "much more confident" and question ask that how she feel after course completion? I wrote "much more confident"
In the 'No more than three words' questions can we us a number and a word. For example, I wrote an answer as 'Seventy Percent', but the answer came out to be 70 Percent. what the answer is "thursday"...and i have written "next thursday"...the limit is no more than 3 words...do i get marks because there is a necessary to answer in one word??? The instruction says NOT MORE THAN TWO WORDS, but what if we write only one word in the answer. will I get a mark? for Example, the answer is "research report" and I have written only research. does is consider true or false?